Best before Britain: how far past foods’ best-before dates are people willing to go? February 16, 2017, 12:01 a.m.
It’s a dilemma we’ve all faced at one time or another. Stood at the open door of the fridge, suspiciously eyeing up an item of food that has passed its best before date, perhaps considering whether or not to advance to the sniff-test or just toss it straight in the bin. Everyone knows there’s a little leeway with those best before dates. Best before dates are about quality, not safety – food does not become harmful once it has passed the best before date, but it might begin to lose its flavour and texture. But how far past that date are people generally willing to push? New YouGov research takes a look at consumers’ best-before habits across eight common food items. People are the least prepared to take a risk with fish and chicken. Almost six in ten Brits (58%) would only eat fish that had not passed its best before date, marginally higher than the 56% who said the same for chicken. In both cases a further 17-18% of people would be willing to eat them the day after the best before date. Brits are slightly more relaxed about how long they can keep the other two meats on the survey – beef and ham. For both meats 39% of people would only consume them on or before the sell by date, with a further 19% willing to eat them the day after too. Bread was the food item people are most willing to eat after its best before date – in fact, 78% would be happy to nibble on a loaf that was past that date, compared to just 17% who would insist on eating it by the best before date. The obvious problem with bread that has been sitting around for a while is that it goes stale, so there is only so long you can keep it around for before it becomes inedible. 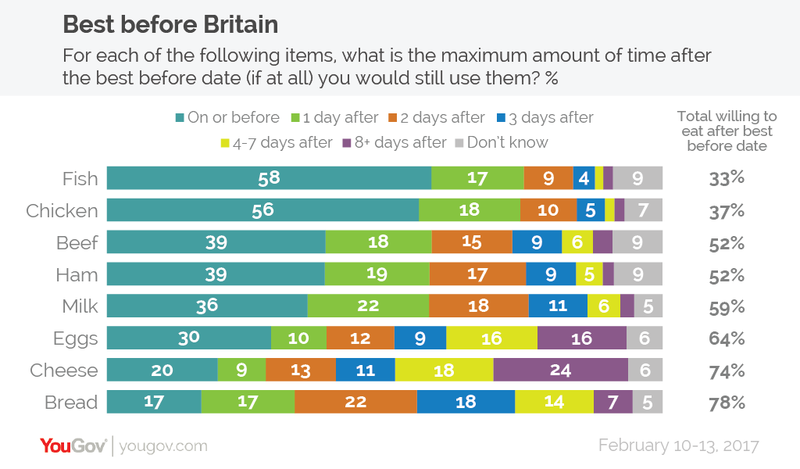 Ultimately, the majority of Brits (56%) would eat bread that was one to three days past its best before date, with two days after being the most popular cut-off point at 22%. Cheese and eggs, on the other hand, are kept for much longer. Almost a quarter of Brits (24%) would be happy to still eat cheese that was 8 days or more past its best before date. Likewise, 16% of people said they would be happy to eat eggs eight days or longer after the best before date.